and makes use of certain services at the USB (canteen, libraries, access to computer and study rooms, printing, copying). 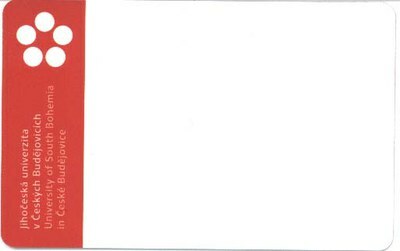 You get the card in Bobík, opposite the dormitory K4, you have to fiil in the application and also you need photo for documents. 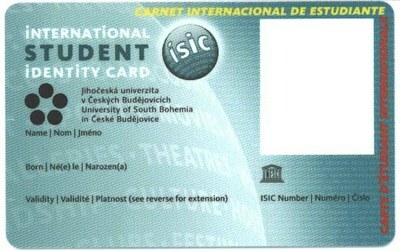 Then you have to choose type of card: one Blue – Student card which is cheaper and one green – ISIC card. The ID card is charged for meals by placing the financial amount at the canteen cash desk (only for meals, there is a different account for printing), the ID card is charged for printing (i.e. also copying) at the faculty, usually in the PC study room or in the library (Uran) or in the PC laboratory “Bobík”. You will receive a control ticket at all cash desks after inserting the amount. Check whether the name and surname are correct.